Sailings not an option for Canadas liveaboards….. Sailing in sundrenched waters with seas the colour of the blue sky and dolphins leading the way as they frolic in the bow wave. Finding the perfect anchorage before the sun sets over palm fringed beaches and lingering on the deck over cocktails as the moon casts its silver shadow, waves gently rocking contented souls. 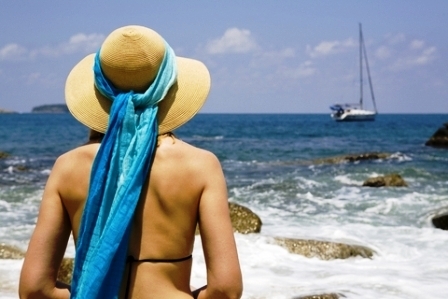 This I envision as the cruising lifestyle … a year round enjoyment. 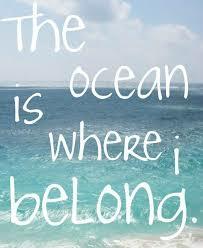 Then my home is in tropical Queensland, Australia. On a visit to Canada I experienced the other extreme and saw how keen yachties do it elsewhere. 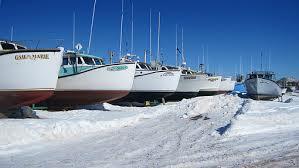 In Canada the sailing season begins to wind down in September and October as they prepare for a long cold winter. 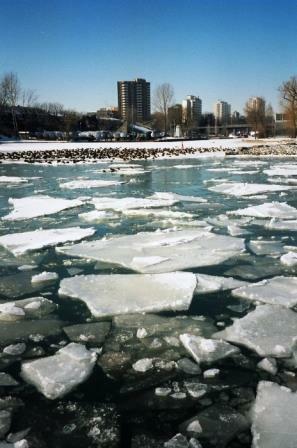 Canada’s Great Lakes are fresh water and quickly freeze as soon as the temperature plummets. A large percentage of yachts and motor boats are hauled out and put on cradles. Masts are taken down and the hulls covered in plastic shrink wrap to protect them from the ice and snow. Ice can be damaging to fibreglass and timber alike, getting into and enlarging even the smallest of cracks. Laying up chores stretch from protecting all the fittings with lubricants and pumping antifreeze into the engine cooling system to draining fresh water tanks. Ice freezes the hatches and companion ways shut and unless you have made provision to get in, it is sealed for the winter. Marinas and anchorages become so solid with ice you can skate on them. Fishermen stand where waves have lapped at hulls just months earlier, making small holes to drop a line. But some sailors actually remain on board their yachts in marinas during the winter, saving their money for other things, including dreamt of cruises to distant sunny shores. 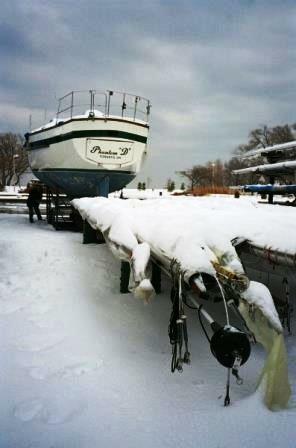 In Frenchman’s Bay near Toronto, for instance, they have had as many as 50 yachts with Canadas liveaboards every winter. As winter closes in they erect an enclosure over there yachts deck. It takes a week to erect the cover and at the end of the season they’re stored for the next winter. Two plastic sheets are draped over the top so that they can use the deck as well as the heated cabin below for living space. The clear plastic sheets act as a greenhouse and heat up above deck. There is a small door in the cover so you can enter the cockpit. Some even add windows. Ruth, who with her husband was just having her first season living aboard their yacht Witchcraft when I met them, explains: “Despite the previous cold snap, wintering in has been terrific. All sorts of people have asked if we are cold. We always knew we were Canadas liveaboards and required heat. Insulation is added to the inside of the hull to prevent condensation and during the coldest months of winter electric and diesel space heaters run almost non-stop. Simple things we take for granted in warmer climates, like filling our freshwater tanks, have to be thought through. Hoses left with water in them freeze and aren’t useable, so Canadas liveaboards tend to have a day when they all fill their tanks. A small bubbler machine is used to keep the water moving. Air pumped through a perforated hose lying on the bottom causes bubbles to rise from the warmer water below the ice and thereby prevent freeze-up against the hull, which would crush it. 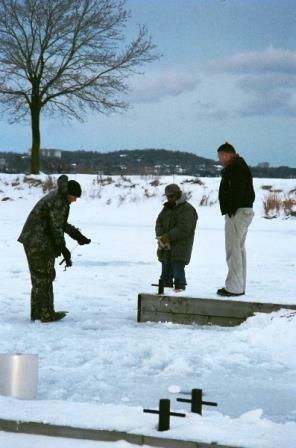 Logs or empty polyethylene bottles strung end to end in the water near the boats can also prevent pressure from the heavy ice build-up. Despite the hardships and drawbacks, living aboard is not a passing whim for most. Some live this way for years saving their money for other things. “The decision to put our money into a bigger boat rather than buying a house and having a mortgage was to save for a trip south,” another cruiser told me. 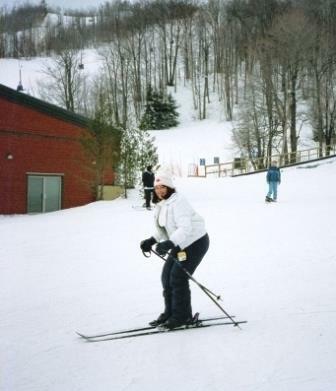 As the days get longer and the snow and ice melt with the onset of spring. In April and May thoughts turn to the coming five months sailing season. Yachts start to come to life and marinas buzz with activity. Winter covers are removed, masts stand proud again and Bob Marley CD’s are slipped onto the stereo. 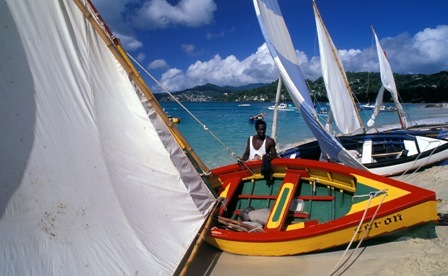 Reggae music transports skippers to places they intend to be next year … no ice, snow and freezing blizzards. Canadas liveaboards dream of sailing south for the winter to the sunny Caribbean and sailing as we do in Australia … year round!